Asst. Adjt. Gen., Hdqrs. of the Army, Washington, D. C.
The sending re-enforcements to General Patterson by drawing off the wagons was a further and unavoidable cause of delay. Notwithstanding the herculean efforts of the Quartermaster-General, and his favoring me in every possible way, the wagons for ammunition, subsistence, &c., and the horses for the trains and for the artillery, did not all arrive for more than a week after the time appointed to move. 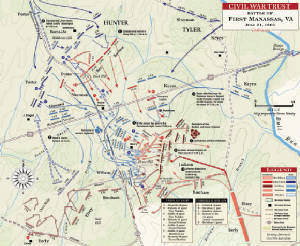 It is known that in estimating the force to go against Manassas I engaged not to have to do with the enemy's forces under Johnston, then kept in check in the valley by Major General Patterson, or those kept engaged by Major-General Butler, and I knew every effort was made by the General-in-Chief that this should be done, and that even if Johnston joined Beauregard, it should be because he would be driven in and <325>followed by General Patterson. But, from causes not necessary for me to refer to, even if I knew them all, this was not done, and the enemy was free to assemble from every direction in numbers only limited by the amount of his railroad rolling-stock and his supply of provisions. To the forces, therefore, we drove in from Fairfax Court-House, Fairfax Station, Germantown, and Centreville, and those under Beauregard at Manassas, must be added those under Johnston from Winchester, and those brought up by Davis from Richmond and other places at the South, to which is to be added the levy en masse ordered by the Richmond authorities, which was ordered to assemble at Manassas. What all this amounted to I cannot say; certainly much more than we attacked them with. I could not, as I have said, move earlier or push on faster, nor could I delay. A large and the best part, so considered, of my forces were three-months volunteers, whose terms of service were about expiring, but who were sent forward as having long enough to serve for the purpose of the expedition. In the next few days, day by day I should have lost ten thousand of the best armed, drilled, officered, and disciplined troops in the Army. In other words, every day which added to the strength of the enemy made us weaker. 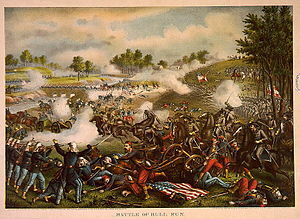 In conclusion, I desire to say in reference to the events of the 21st ultimo, that the general order for the battle to which I have referred was, with slight modifications, literally conformed to; that the corps were brought over Bull Run in the manner proposed, and put into action as before arranged, and that, up to late in the afternoon, every movement ordered was carrying us successfully to the object we had proposed before starting--that of getting to the railroad leading from Manassas to the valley of Virginia, and going on it far enough to break up and destroy the communication, and interpose between the forces under Beauregard and those under Johnston; and could we have fought a day--yes, a few hours--sooner, there is everything to show that we should have continued successful, even against the odds with which we contended.